Shopping for James Bond Prop Replicas? The Jaws Teeth Prop Replica takes a bite out of… well… everything! Limited edition, hand signed by Richard Kiel. Worn in James Bond's The Spy Who Loved Me and Moonraker. Cast from the original molds in dental-grade surgical steel! The Jaws Teeth Prop Replica takes a bite out of… well… everything! This stunning item is an officially licensed, 1:1 scale replica of the fearsome metal teeth worn by Jaws in both 1977's The Spy Who Loved Me and 1979's Moonraker of the James Bond franchise. 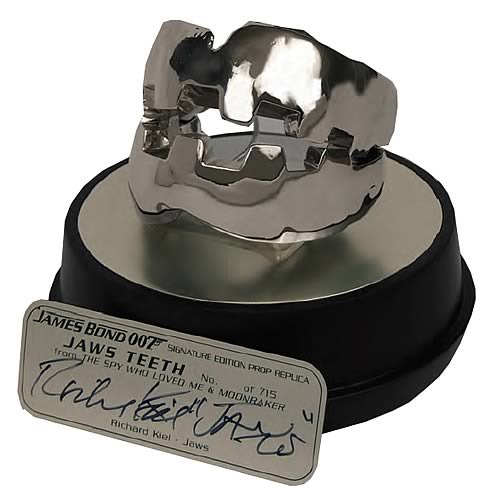 Cast in a solid and highly polished dental-grade surgical-steel alloy from copies of the molds used to create the original prop, the Jaws Teeth Prop Replica comes with display stand, acrylic cover, certificate of authenticity, detailed prop-story booklet, and numbered plaque… hand signed by actor Richard Kiel. It's truly amazing! Limited edition of 715 pieces worldwide.